My book on creative vegan cookery, V is for Vegan, is published today. It’s one of the most original cookbooks you will ever see, with delicious recipes ranging from easy to complex. You will have recipes on how to make tofu, vegan butter, nut milk, nut cheeses as well as ramen bowls, beetroot ravioli Georgian style, watermelon stir fry, sage and squash pizzette, vegan trifle, chocolates and mousse au chocolat. Order the book here today. Many of the recipes are made easier by using a Vitamix blender/food processor. I’ve been using a Vitamix since 2012 and I can honestly say I use it almost every day. It doesn’t take up much room on the counter but does so many things. (I’ve put my old blender in the cupboard as a result, I just don’t use it, once you’ve gone Vitamix, you can’t go back). You can make your own instant icing sugar, rice flour, oat flour by grinding it. It’s wonderful for smoothies and dips, sauces and soups, nut butter, nut milks, tofu. It is expensive but worth the outlay as you use it so often. And most importantly, it’s easy to clean, a quick rinse through. The model is a Total Nutrition Centre which comes in black, white, red or brushed stainless steel. If you win, you can choose which colour. This is an amazing giveaway worth £450! I don’t often do giveaways, but this is a real treat for my readers. Answer the question below, follow @msmarmitelover and RT this post. What is your favourite recipe from the book and why? Good luck everybody and hope you love (and buy) my book. P.S. Don’t forget the Secret Garden Club supper club at my place this Sunday 26th April, book here. 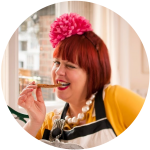 This competition is held jointly by Vitamix UK and msmarmitelover.com. It is open to UK residents only. The deadline is the 23rd of June 2015. The winner who answers the question correctly will be picked at random. 1 entry counted per person. 1 prize. 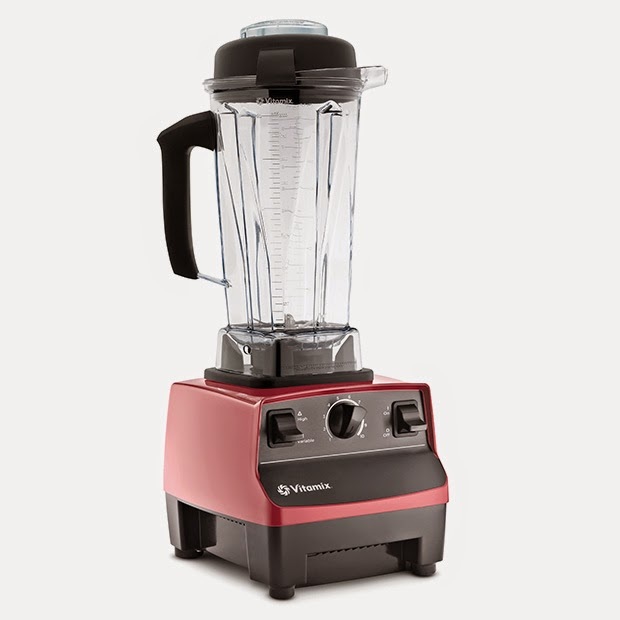 1 winner will be sent a Vitamix Total Nutrition Centre in the colour of their choice. The winner (UK only) will be chosen at random. Awesome giveaway – I've wanted a Vitamin forever. Quick question though – do you want us to reply with the answer to the question on twitter or in this comments box? Hi Doctor Faye, I'd like you to answer here. Note: I've changed the question to enable people to give creative answers. I have to admit I look for the easier recipes first so as not to scare myself off. So I would say the Roast Parsnips and Jerusalem Artichokes recipe is my favourite. I especially love the bit about how cumin might help with the 'fartichokes'! I am wracked with indecision about what I will cook first. A toss up between the Pomelo, Chilli, Peanut & Coriander Salad; I always see the pomelo winking at me in the local grocers but never know how best to use it. My other choice would be the Uthappam, I love them to eat and if I learnt to make them at home I could truly satiate my greed! Hot-smoked marinated tofu. I always struggle to get flavour into my tofu dishes so introducing the smokiness is wonderful and will bring a new dimension to it for me. Would love to try your Mexican brownies. Want's not to love there? I eat LOADS of Peanut Butter, I swear I am addicted to the stuff so I would love to have a go at making my own because there has to be way too much sugar in the shop bought stuff. It was great to meet you at the #ArgosGardenParty I have come away feeling very inspired and can't stop thinking about those yummy sweet chilli peppers with halloumi, delicious! Thanks all! Do keep 'em coming. This is a great prize. I'm also keen to hear feedback on the book. It has to be the advocado and oero cheesecake – what an amazing idea! Benign Dictatorship Saffron Spaghetti. I want to make that first – also it has the best name! I'm dreaming of making smoothies for the kids with the Vitamix then after they go to bed cheesy popcorn for my husband and kale chips for me while we watch a film and relax! the avocado oreo cheesecake is seriously calling my name, so tempting! I like the Energy Balls, perfect for that mid morning snack or mid afternoon slump to keep me going until home time! I'm going to try the vegan 'Parmesan' – I've tried making it before with cashews not pecans but I'll give it a go. Vegan sliders with all the fixins sounds great – I've been looking for a healthy alternative to burgers. It has to be gnocchi in tomato/basil broth, I really love this, I have cut back on sugar and salt, my sister does not cook with salt in her food, I told her that you need a small amount for the body, there is so many to choose from in the book, I am struggling everyday to find what to eat, my doctor said to me that my iron level is low, I am sure if I had a Vitamix Blender I can mix all the veg & fruit's that I don't like to help me. I believe that fermented foods are the 'next big thing' – they already are in this house! – so for me the kimchi recipe is top of the list! The Soya Yoghurt sounds lovely! I love your guacamole recipe. I'm a great avocado lover and I use it extensively in salads. And like any mexican dip guacamole goes down a treat with a crisp dark rye ryvita slice. Competition or not I had a throrough read at your book and found it very useful. I've been vegetarian for 45 years and caught very good ideas! Vegan 'Parmesan' sounds so much better than other ones I've tried before. I like to make little things to ad a burst of flavour to my meals! The black & green cheesecake sounds great. I love cheesecake! The Skordalia because it's so garlicky my colleagues refuse to speak to me (no loss there then) and it's bloody marvellous with roasted aubergines, stuffed in a pitta, with me, stuffed in a chair. advocado and oero cheesecake because it was absolutely amazing – i've tasted nothig quite like it before and the taste is so unique! Tagine of carrots, peppers and lentils is my real favourite. The Moroccan spices and textures of the lentils with the veg make it a superb hearty meal. I love the sound of the mousse au chocolat. If it's chocolate, it's my fav! Skordalia because it is the perfect food for the summer plus is good for people with high blood pressure! smoked basil and beetroot tofu – I have a beetroot obsession at the moment and I love tofu too! My favourite recipe is the black bean chilli as my kids like it too! The date, sugar and cardamom compote as it is simple but full on flavours that appeal to my sweet tooth. I am learning more and adding to my recipe reportoire! I got my mitts on the cookbook early this week, yay – loving the originality. First recipe I want to make has to be the Oreo cheesecake – awesome, though the Pate de fruits also appeal. I am entering for my sister in laws rather than myself, fingers crossed. The block tofu is my absolute favourite! Tofu is one of the few things I don't know how to make myself, and now I can learn to be a tofu pro! A Vitamix has been on my wish list forever! I think the black and green cheesecake is so inspiringly creative and a MUST have to share with guests – as well as being perfectly delicious, it also makes for a great talking point! I will admit to not having attempted to cook with tofu before (and eating it only a few times) but I had been wanting to change that, so the 'Tofu Shakshouka' seemed like a great introduction. I am definitely making it again! There are so many lovely recipes in the book, and the 'Mosaic of Betroot & Radish' was one of the first that caught my eye.. it looks so stunning too! The avocado and oreo cheesecake sounds delicious! i have only recently become vegetarian and am more in touch with my indian roots learning to cook an array of vegetable meals and i loved your uthappam recipe. Its so versatile as i use it for many different dishes savoury or sweet. My mum's a bit old fashioned, and still finds being vegetarian and vegan very strange. I'd love to make her the trifle so she can see she can still have her "normal" food! Falafel Slider, Sweet Potato sounds lovely! I've just dabbled with my first ever cheesecake. It was a very indulgent Nutella cheesecake – A LOT of nutella mixed with the cheese, and some in the base too. I loved it so I am looking to try some other flavours, sticking with my sweet tooth's favourite things. Oreo cheesecake could be a good place for me to go – but adding avocado, sounds interesting. My nutella cheesecake was a bit sickly, especially with the size of slices I cut – I did say I put a LOT of nutella in. The Avocado would cut through that though and would make me feel a little less guilty – well, it's a fruit after all. Great idea that I will definitely be trying. Loving the other ideas in the book – from pesto, enchiladas, some real gems that I have to try. If I can find all the ingredients that is. Do you (I haven't looked hard enough) have a section/guide on where you get some of the less conventional ingredients – my small Tesco doesn't cut the mustard. The waffles and crumpets. We love a lush breakfast and having a Vegan Daughter I admit to suffering from lack of inspiration when cooking is concerned. This helps a lot, and its healthy too. I Love V is for Vegan I have already made the Rice n Peas, it filled the house with the mellow smells of coconut and thyme. I tried the hibiscus flowers and blue corn tortillas. As a foodie and a cook I already had hibiscus flowers and blue corn in t he store cupboard. I was thrilled to find a recipe that used them both and loved the results. I didn’t know you could eat hibiscus flowers; I have only ever used the concentrate from hibiscus flowers as a drink. All of those flowers that I have thrown away that could have been filling tacos. I Love the stories that Kerstin tells stories that go with some of the dishes, because food is about flavour but also about moments and memories. I looked up Iris Berry the poet that goes with the Kashi and Bows recipe. 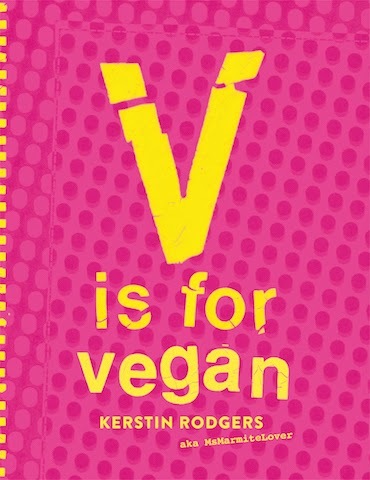 V is for Vegan is a book you read from cover to cover. I will make the vegan parmesan cheese the vegan spread and although I am a little nervous about it I will also make the tofu. My daughter loves Tofu I have taught her to cook it but will love teaching her how to make it. I love the Hairy Dieters. It's the Hairy Bikers diet book and their are a lot of healthy filling low cal recipes. My favourite being the Leek lasagne. Leek instead of pasta sheets, genius!! Thanks everyone for your entries. The winner is Tansy's Kitchen. Congratulations, Vitamix UK will be in touch with your prize.